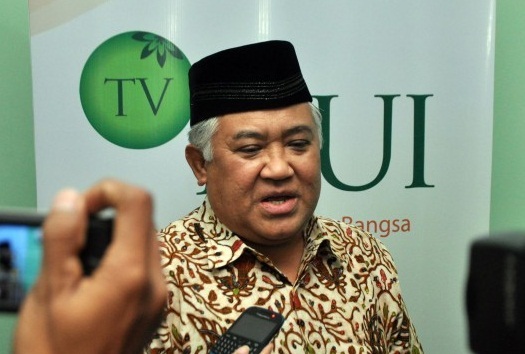 Home > INTERNASIONAL > Ulama hunted by the police, Din: As a Muslim, it made me disturb ! Ulama hunted by the police, Din: As a Muslim, it made me disturb ! BeritaIndependent.Com | Prof. Dr. KH. Din Syamsudin as a Chairman of the MUI Advisory Council took an exception to the baseless accusations that rounded up Ulama and Activist. Those are related to the case of Adnin Armas as a Chairman of the Justice For All Foundation, who used as suspect by the police on the case of infaq funds to the Fatwa Guards National Movement (GNPF) MUI that compiled by using the Foundation Account. Din rated that the Police had overreach. He also challenged the police don’t favoritism to disclose a similar case. "If the police will disclose everything, we can give the case, like teman Ahok’s money, or the Police’s fat bank accounts. Or anything" Din said in MUI Office, Jakarta, yesterday. He also said that there is only two choices, disclose all similar cases without favoritism or stop it. "I thought that police must stop this case in order to do not add asphyxiate to Muslims with injustice, "he said. If police overreach in order to rule the law or further unfair it will generate the public's disbelief to themselves, Din warned. "I hope the police see this case clearly," an ex-chairman of Muhammadiyah said.